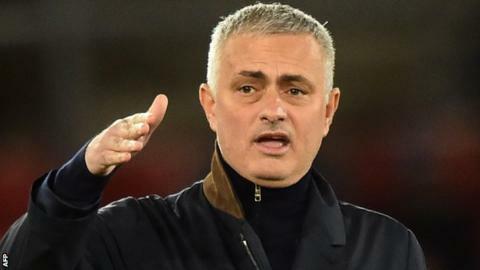 Manchester United manager Jose Mourinho says his target of the club being in the Premier League top four by the end of December has "changed". Mourinho had come up with the aim before United's 0-0 draw with Crystal Palace on 24 November. After Saturday's 2-2 draw at Southampton, they are seventh and eight points off a Champions League place. Analysis: Is Mourinho getting a fair deal? After the Saints result, Mourinho had told Brazilian television network RedeTV that United needed a "miracle" to finish in the top four. But on Tuesday he sought to clarify his comments. "If I used that word, it is not what I think at all," the Portuguese said. "I don't think we need a miracle. We don't need to waste points where we don't need to waste. "Before Palace, I said my target would be end of December in top four. Now the target has changed. Now we have to try to be very close to these positions. We need not to be so unlucky with problems that we have. We need some players to perform." Asked if their current league position was not good enough, Mourinho compared United's position to sixth-placed Everton. "I can agree even though the investment Everton made was phenomenal," he said. "I don't think Everton will be in front of United by the end of the season." There were reports that Mourinho criticised midfielder Paul Pogba after Saturday's draw, calling him a "virus". The pair's relationship has been under intense scrutiny this season and Pogba was stripped of the captaincy in September. Asked if he call Pogba a "virus", Mourinho said: "I don't play the game of suggestions. "One thing is to speak about an interview to Brazilian TV, which you can see. It is another where I am quoted by someone else. I don't speak about that. You saw me in the press conference. It is another thing that someone told what I told. I don't respond to that." "Mourinho does more point-scoring off the pitch than his team does on it," Sutton said on BBC Radio 5 live. "It's not a happy camp, this started in pre-season. They finished second last season, look where they are now. What's going to happen in January? Can he be trusted with a pot of money in January? This is a United team that is falling at an alarming rate. "I think he wants the sack, why would you behave in that manner? "His signings have been a disaster and he wants more money. How can they trust him with the performances the way they have been? What is good about United this season? And it all comes from the manager, who is blaming everyone else." Is Mourinho getting a fair deal? Read more on Manchester United: Is Jose Mourinho getting a fair deal?